Will Spring Game Jump Start 2020 Class? We are less than a week away from the Sooners Spring Game. It is all you see on Twitter. 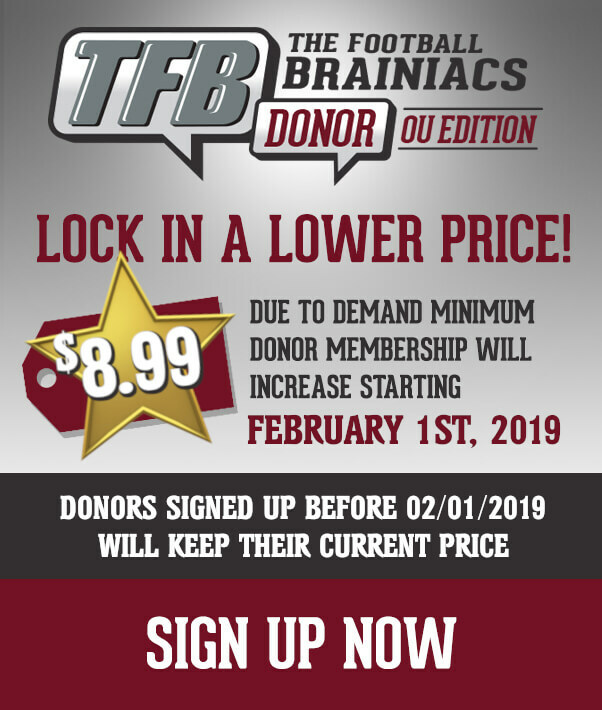 Lincoln Riley has been pleading with the fan base to show up in large numbers. The Sooners are rolling out the events that will take place throughout the week. Spring Game moved to prime time Friday night at the Palace! Concert at 6:30, kickoff at 7:30. My guess as to what you are really interested in at this point is…How many ‘Eyes’ will Lincoln Riley send out which signify another recruit has given his verbal pledge to the Sooners. You had WR Theo Wease and DB Jamal Morris who went on to become Sooners and then you had WR Arjei Henderson, RB Jaylan Knighton, DL Derek Green, DB Jarrian Jones, and DL Jay Hayes who committed to OU but for one reason or another, they did not end up in the class or are currently still looking for a home. While the ‘two out of seven’ ratio is not what OU is looking for when it comes to commits, in the big picture, the Spring Game was a massive success as 11 of the players who attended the event did go on to sign with OU. WR Jadon Haselwood is a perfect example. He took his official visit to Norman that weekend and he didn’t return throughout the season, yet on signing day, he inked with the Sooners. The Spring Game weekend also solidified the Sooners case for guys like EJ Ndoma-Ogar, Stacey Wilkins, Joseph Wete, and Jaden Davis to name a few. So the Spring Game recruiting event works, and this year there is a possibility of the Sooners having another big weekend on the recruiting scene. Who are some of the names you should be keeping an eye on? Those are just some names to keep an eye on but I would not be surprised to see a set or two of eyes that come from out of the blue. Could be a 2020 kid or even a 2021 kid who gets caught up in the moment. I will stick with my 3.5 over/under number on the number of ‘eyes’ that Lincoln sends out and right now, on Tuesday, I would probably be inclined to take the over. Ultra athletic 2020 LB, Kourt Williams out of California (St. John Bosco) took an unofficial visit to Oklahoma this past weekend. Earlier this week, I spoke with Kourt about how the visit went and his recruiting plans moving forward. Going into the OU visit Kourt was coming off of recent unofficial visits to Penn State, Ohio State, Notre Dame, Michigan and Texas A&M. Kourt says that he has a few more unofficial visits to take before he begins taking his official visits. Some of the final unofficial visits will likely come in May when he plans to try and visit schools like Tennessee, Georgia and Clemson. While the Sooners have been in regular touch with Kourt since his offer earlier this year, this was his first chance to visit campus and be around the coaches. “I had been talking to the coaches, coach Odom, coach Grinch and coach Riley before the trip and I was really excited for the trip just meeting all the coaches and stuff and I could tell that it’s really family oriented over there. They are high on family, making you feel like family, making you feel comfortable. And they have a tradition of winning. All that really stood out to me”. In terms of position, Kourt said, “they really run a true nickel defense. They don’t really have that hybrid position so I’d be playing that ‘WILL’ linebacker and that’s the kind of linebacker that can run sideline to sideline; that has speed, kinda that make guy on that defense”. At the Opening, Williams measured out at 6’1 215+ lbs. So, as I previously noted, he’s about DaShaun White’s size at the same point in high school. All spring we’ve heard people rave about the OU practices and the intensity with which Grinch runs things. Kourt felt the energy right away. “It was real cool. They did a little hitting drill called the gauntlet drill to start it up and that was real turned up. I was able to watch the linebackers. I really liked it a lot”. He went on, “The coaching energy was really really really high compared to a lot of the schools I went to. The coaches are into as much as the players are, you know, just giving out calls, fixing mistakes and telling players what they need to do”. Kourt also commented on the fact that the Sooners defensive staff is now one of the younger staffs of the schools he’s visited, something that wouldn’t have been the case just last year. “The fact that they’re younger than a lot of coaches out there right now, they bring a whole different swag to it. They can relate to us”. The OU visit went well enough that Kourt tells me he will take a return visit back to Oklahoma. Although he’s taken a number of visits, on his second round of visits, he will be looking to get that feeling that lets him know exactly where he should be. “All of the schools say similar stuff, they have similar stuff, the academics, the network, all of them really have that. I feel like I’m going to have to go to all the places I can and then I’m going to have to go there twice and then rely on that gut feeling. I haven’t had that gut feeling anywhere I’ve been so far. Wherever I go it’s going to be away from the west coast because I want to go away”. The fact that Kourt is likely to leave the West Coast is significant because Kourt’s father played at UCLA but he says, unless something changes, it’s very unlikely he will stay in the PAC 12. Kourt tells me he has his eye on a return visit to OU for his official, this summer. Kourt talked about why he prefers to take his OU official out of season as opposed to a game in the fall. “Taking an official during the game, the coaches main focus during most of the time is the actual game. I feel like if I’m able to take an official before the season I’ll have more interaction with them”. I really get the sense that it’s that connection Kourt is looking for that will help him make his decision. Kourt had a chance to sit down with Lincoln Riley and talk about the impact they feel Kourt can have on the Sooners program. “Coach Riley is a real cool dude – real personable and real easy to talk to. They’re saying they are really short on linebackers right now and they said with my skill set and my athleticism I’d be able to make an immediate impact. And just the fact that they’re a growing program and they were this close to making it to the national championship last year. They feel like if they can get a strong enough defense, they can win it all”. Other than the OU official visit, Kourt says he wants to take a return visit for officials to Penn State and Ohio State and possibly Texas A&M. He’s eying a fall decision but he didn’t rule out the possibility of doing something earlier. If you would like to read the ‘Insider Note’ which accompanies this article, please check the Donor Board! ***Brian Odom has confirmed what we first reported in that RS Sophomore Ryan Jones has been moved to the WILL linebacker position. He added what we also noted in that Kenneth Murray (MIKE) and DaShaun White (WILL) are at the top of the depth charts at their respective positions. *** Also confirmed with James that the NCAA has also approved Nick Basquines request for another year of eligibility due to medical issues. Basquine will be eligible to play for the Sooners in 2019. *** 2020 OT Brady Ward (Mobile, AL) had been planning on taking his official visit to Norman for the Spring Game but there was one problem, it fell on the same week as his prom. Initially, he made the decision to take his official visit but he let me know that the young lady he had previously asked to go to Prom with him had already bought a dress and such and he decided that he should honor that commitment and attend the prom. He let me know that he and Coach B speak every day and they have ‘a phenomenal relationship’ and he will be taking an official to OU later this spring and OU is absolutely in his top group of schools along with Alabama, LSU, Arkansas, and Ole Miss. 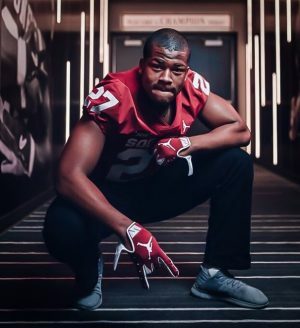 *** 2020 RB Seth McGowan will also not be able to make the trip to Norman for the Spring Game this weekend. Super K has been in touch with Seth and he let him know that he plans on taking an official visit to Norman for the first weekend in May. *** That first weekend in May looks like it will be another important weekend for OU as we already know Noah Nelson is planning on taking his official visit that weekend and we are hearing there will be a few more recruits who will potentially be coming in as well. *** Super K also was in touch with 2020 DL Alex Huntley‘s (Columbia, SC) mother who let him know that they would not be in Oklahoma this weekend but Alex plans on rescheduling his official visit in the near future. *** Super K has confirmed that 2020 OLB Jordan Banks (Harbor City, CA) will be making it in this weekend for an official visit. K had a chance to see him back in February and will be able to give you more on him in the future. 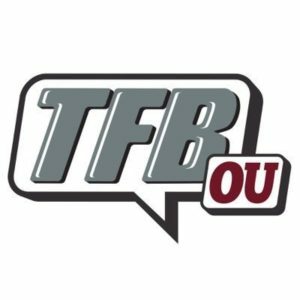 The hay is in the barn so to speak as OU held their last practice before the Spring game coming up this Friday at 7:30 at the Gaylord Family Oklahoma Memorial Stadium and we had a chance to talk to Alex Grinch and a few players before the big game. *** Coach Grinch is going to be one of those coaches that is never happy about practice until he has a defense that is the best in the conference and one of the best in the country. Once again he said he saw a lot of bad plays at practice recently, but he also said in the grand scheme of things he saw some good things as well. *** Grinch says that progress has been made within the OU defense and he said that the players want to improve. He says that breaking old habits within the defense has been difficult because he said they want to be great, but when they don’t reach those levels they have a built-in excuse about why they aren’t reaching them instead of just accepting the fact they are not there yet and work to get better. Too many times this spring guys on defense try to blame anything but themselves when things don’t go well and until they get that accountability the growth on the defense will be stunted. *** Coach Grinch says he hates what has happened to Caleb Kelly but he feels with the redshirt that is before him that if he handles it right that he will be even better moving forward. *** With Kelly out Coach Grinch feels the other linebackers have a great opportunity in front them and it’s going to be interesting to see who steps up and seizes that opportunity. DaShaun White will get that first opportunity, but once again Grinch sang the praises of Brian Asamoah saying he has had a very good second half of the spring. *** Accountability is sometimes missing on the defensive side of the ball right now. *** Grinch says he’s not trying to make a big deal of the spring game for his defense because there will be a lot of guys on the field getting their first opportunity to play in front of a big crowd and he doesn’t want to make the game too big for them. He says it will be a big opportunity for some of the guys because they will not be able to hide and they will get exposed and he will be able to find out if the guys are part of the old mindset or are they going to be part of the process that springs this defense forward. *** Grinch says they have put the entire defense in so the players know it. They are not scheming an offense but he expects the players to run the defense and go make plays. *** Grinch says he will be on the sideline Friday and this season because he just feels with a new defense he needs to get the feel for how things are going on the defense that only being on the field can get that feel for him. He says he has done both and he doesn’t really have a preference and says at some point at OU he might go to the press box, it all depends on how he feels about his defense. *** He says most of the time when the defense fails it’s because of a players mistake and not the scheme. They either get out-executed or bust an assignment and some players up to this point still are still not looking at themselves as the root of the problem. *** Grinch says being 126th or whatever it was in pass defense should be enough to drive the players into being better, and he is at times disappointed that there is not more of an accountability from the guys, especially guys that he coaches in the secondary, in realizing they were part of that and need to improve. *** Grant Calcaterra feels the offense started to get better after they returned from spring break and the offensive line settled in. He said for a while the defense was playing with more passion and a lot more energy but once the offense started to match that energy they started to play better. *** Calcaterra said that the players had a good time putting together the showdown spring game video that is on Twitter. OU put out a video with the offensive guys being the red team and the defensive guys the white team. He feels the team is going to put on a show for the fans. *** Not being a quarterback, Calcaterra says the other guys on the offense are going to do their part to make sure the quarterbacks have a good game. He says the offensive line has formed a bond and are becoming a good unit. *** Calcaterra has been impressed with Jalen Hurts work ethic and ability to come in and pick up a new offense as he has. He is always working on it and studying it, asking questions and working as hard as he can to get a feel on what is going on within the offense. *** Nick Basquine found out that he had been granted an extra year of eligibility from the NCAA from an e-mail. He said he still wasn’t sure but he knew it was the real deal when Coach Riley told him the news. He said that the family had no celebration or anything but everyone is happy to get the news. *** Basquine feels like a pro in the program as he will have his Masters Degree at the end of this semester and he has been around the program so long. *** Basquine is confident that the inside slot guys of himself, MyKel Jones, Jaqualyn Crawford, Drake Stoops, and Trejan Bridges will be very good and will be a very productive group this year. *** Basquine says he has not felt this good since early in his career at OU and that he feels he even feels better as an athlete because he is bigger and stronger, and even faster if we can believe that. *** Crawford said that he believes that if the 2019 squad had a race among the fastest guys that he would be in the race along with Tre Brown and Charleston Rambo. *** Crawford said getting into a couple of games last year and taking advantage of the new redshirt year really helped him get ready for this year and he feels he will be more than ready to contribute this year. The visitor list for the spring game is ridiculous. We currently have more than 20 recruits telling us they plan on taking official visits and the list is growing. As with every big visit weekend, the list will change as kids get added and some planned visits fall through. Below is the list we have assembled and verified on our own. Expect to see this list change as the weekend of April 12th-14th approaches.